Business Management About Faculty Latest News Professor from the best university in Brazil visits VGTU for meetings with students and VGTU community. Professor from the best university in Brazil visits VGTU for meetings with students and VGTU community. Professor of Auditing and Coordinator of International Relations Joshua Onome Imoniana from the University of São Paulo, Brazil, visited Vilnius Gediminas Technical University (VGTU). The University of São Paulo is the best higher education institution in Brazil. According to the QS international ranking it ranks at the 120th place. In addition to teaching, the professor consults SMEs on audit and control of information systems, he also works as an accountant at the Institute of Public Accountants in Australia. The visit was held under the Erasmus+ international mobility programme. 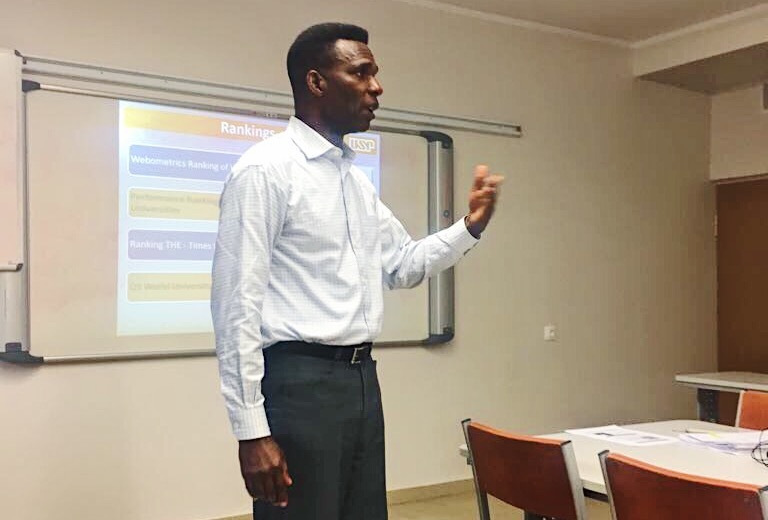 Prof. Joshua Onome Imoniana read lectures on accounting and auditing to students at VGTU’s Faculty of Business Management, participated in “Quality with Coffee” seminars and shared the best practice on quality of studies with the faculty’s community. On 22 February, the Professor visited VGTU’s International Relations Office to share his insights from the lectures at VGTU and discussed the details of Erasmus+ international mobility programme and the partnership agreement between VGTU and the University of São Paulo. Under this partnership agreement, in the autumn semester of 2016/2017, VGTU’s 4th year student Lukas Keraitis from the Faculty of Creative Industries visited São Carlos School of Engineering (EESC) at the University of São Paulo under exchange programme; lecturers Justas Nugaras from the Faculty of Creative Industries and Mindaugas Samoška from the Faculty of Business Management read lectures and participated in meetings with representatives from the University of São Paulo. Apart from this agreement, VGTU has several other inter-institutional partnership agreements in Latin America with universities in Chile, Salvador, Columbia, Uruguay and Peru.